Perched on top of terraced slopes and commanding a stunning view of Bauddha Himal, Barpak was once famous for its bucolic setting popular with homestay backpackers, relatively good infrastructure and round-the-clock electricity. All of that was destroyed in the 25 April earthquake. Now, eight months later, as the temperature dips to minus at night most of the town’s 15,000 residents continue to live in flimsy makeshift shelters. With remittance from Gurkha soldiers, Barpak is better off than most other villages in northern Gorkha, it got a lot of media attention and emergency relief in the weeks after the quake. But even here rebuilding houses has been agonisingly slow. Rubble from collapsed structures still lay strewn across the village and only a handful of houses have been rebuilt. If this is the situation in Barpak, one can imagine what it is like in remoter settlements like Uiya and Keraunja. 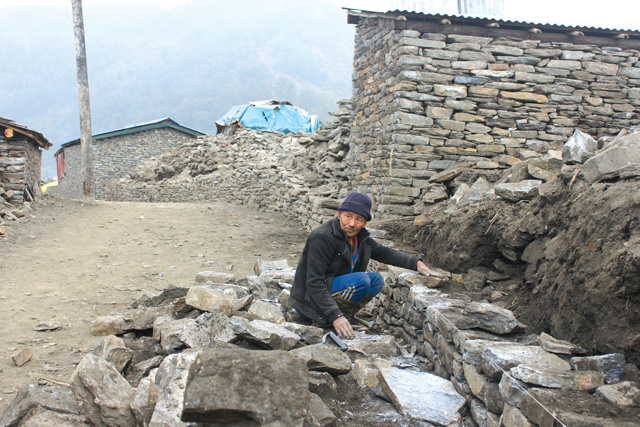 “We believed the government would help build our homes, but after waiting and waiting we have realised that we have to rebuild our village on our own and not rely on others for help,” says mason Durga Bahadur Ghale. Local families are reluctant to build for fear that they may fail to comply with earthquake-resistant building codes and not be eligible for the government’s promised Rs 200,000. Regardless of this, the commitment to rebuild the town far outweighs the uncertainty and this is reflected in the collective effort of townspeople to widening the narrow cobblestone alleys. STICKS AND STONES:A mason takes a break from building a traditional stone house. “There were plans to widen roads before the earthquake but it was not possible without demolishing many houses. However, the earthquake reminded us about the importance of wider roads for safety and emergency services,” explains Yam Bahadur Ghale of the Bauddha Himal Academic Boarding School. Along with fostering strong community values, the reconstruction has also become an opportunity for locals to earn food rations. Every fortnight, the World Food Programme (WFP) and its Food for Assets initiative distributes rice and lentils to those involved in reconstruction. “Food for Assets enables people to be actively involved in urban renewal, but such efforts are needed from the government’s side as well,” says pioneer community leader Bir Bahadur Ghale who put up a microhydro plant here in the 1990s, long before the rest of the district was electrified. The 130 kilowatt plant was destroyed in the earthquake, and is being rebuilt. 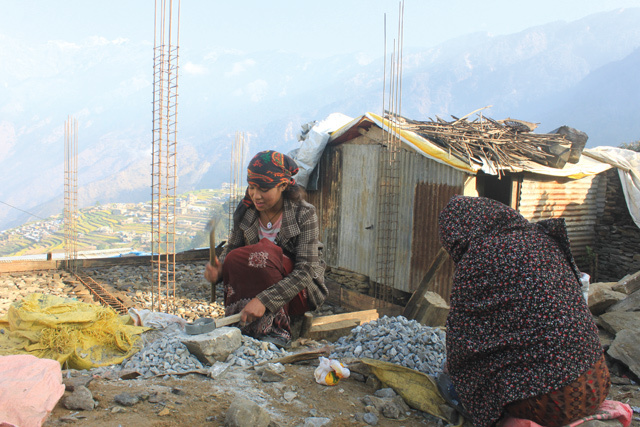 A woman crushes stones at a reconstruction site in Barpak. With support from the US-based Gorkhaly Foundation, a diesel generator used to provide power four hours every evening, but that has been reduced to two because of the fuel shortage. Barpak Rural Electrification won the National Geographic Society Great Energy Challenge grant of $70,000 recently to rehabilitate the 133 kW micro-hydro project and use the electricity to help with reconstruction. With work in full swing, 24-hour electricity should be back in Barpak by February. In the immediate aftermath of the April earthquake, information technology played a crucial role in disseminating information, mapping affected areas and helping coordinate relief efforts. StoryCycle’s ‘Impact Stories’ is one such digital initiative that highlight stories and data from earthquake affected areas to direct support for projects and enable rebuilding. “Technology on its own does not work, it is the emotional connection you create through it that will help in the rebuilding process,” says Saurav Dhakal of StoryCycle. Highlighting villages like Barpak, Rautatar and Thame, users can start their own campaign by creating a profile for a village and listing funding needed. StoryCycle has also started ‘BuildCamp’ in which the building process of an area is facilitated by a mixed group of architects, engineers and storytellers who contribute their expertise to design the ideal community. 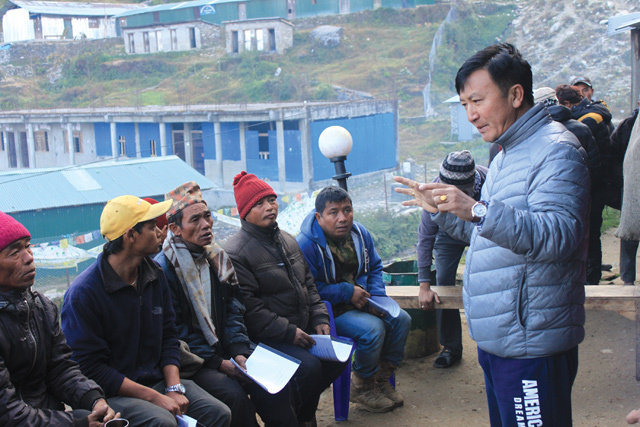 The first BuildCamp in Barpak involved community leader Bir Bahadur Ghale and documented stories with community mapping which increased the town’s digital footprint. BUILDING BETTER: Community leader Bir Bahadur Ghale speaks about earthquake-resistant building techniques in Barpak last week. Also helping out in Barpak is Nepal’s rural internet maverick, Mahabir Pun, who is replicating his work in establishing wireless connectivity in Kaski and Myagdi in the earthquake affected districts of Gorkha and Lamjung. Eight schools and three health posts will be connected with up to six hotspots allowing classes to have e-learning and providing health posts access to tele-medicine. “The connectivity allows villages to benefit from many services and does not require them to come all the way to the cities. The need to connect is not just after natural disasters, it has become an everyday necessity,” Pun told us. After receiving a grant of $80,000 from the Internet Society’s Wireless for Community Program (W4C), Pun was visiting Gorkha this week to establish internet connectivity and get communities involved in its long-term use and maintenance. Gorkha’s wireless network will run on solar electricity from Gham Power and will be ready in a month. After Lamjung and Gorkha, Pun plans to expand the program to schools in Sindhupalchok and Kavre.